Even in the midst of an injury or legal matter, life goes on. The bills don’t stop coming. But if you’ve been injured or have found yourself out of work while dealing with a lawsuit, it can be really hard to pay all those bills. That’s why plaintiffs across Lexington, the surrounding suburbs, and the rest of Kentucky turn to pre-settlement cash advances to help them make ends meet. After you’ve been injured in an accident, you may require surgery or other expensive medical treatment. You may be unable to attend work and maintain a steady income. And your personal injury lawsuit may drag on for several months, leaving you unsure as to when you can expect a settlement. Thanks to a personal injury lawsuit cash advance, you can continue to pay your rent or mortgage, cover your utility bills, buy groceries, and even have a little fun and relaxation from the stress. Plaintiffs in Lexington, the rest of Fayette County, and all over Kentucky have qualified for these lawsuit loans in as little as 30 seconds, and have received as much as $5,000 in just 24 hours. If you’ve decided it’s time to get this lawsuit cash advance to help you make it through lean times, then it’s time to contact Interstate Lawsuit Funding. We are a fully-staffed, direct lender, with a team of professionals who understand the nuances of Kentucky law and are able to make a quick decision on your eligibility. We can issue lawsuit loans to plaintiffs in the beginning, middle, or end stages of litigation, and the cash we offer can be the difference between struggling and surviving as your case makes its way through court. There are plenty of qualified personal injury and litigation lawyers in the greater Lexington region (click here). All you need to do to get started is fill out our simple, 30-second application online, or give us a call. We’ll find out some details about your case and your circumstances. Then, we’ll contact your attorney and determine how much of a cash advance you are eligible to receive. Since we are a direct lender, once we determine the amount of your loan, you’ll receive the money straight from our office. To give you further peace of mind, Interstate Lawsuit Funding offers non-recourse lawsuit loans. That means that if you settle or win your case, the loan payment will come straight out of the proceeds. If you lose or your case doesn’t settle, you won’t pay us anything back. The goal is to keep you from paying out of pocket, so you don’t find yourself saddled with more debt and stress. Contact Interstate Lawsuit Funding today to find out if we can offer a cash advance for your auto or motorcycle accident, medical malpractice, negligence, slip and fall, burn injury, or other type of lawsuit. Find our 30-second application on our website, or call us at 954-946-0487 to get the process started today. 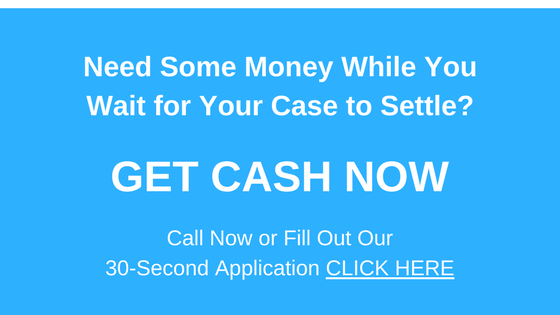 Apply for a Lawsuit Loan / Presettlement Cash Advance, CLICK HERE.